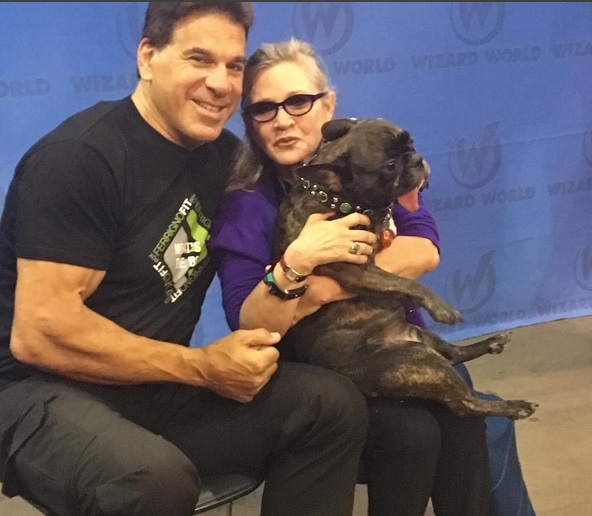 Carrie Fisher who passed away on 27 December had a frequent companion who followed her to most of her interviews, her dog Gary. Carrie Fisher widely remembered for her role as Princess Leia in the movie Star Wars passed away on 27 December at the age of 60. While people across the world mourns her demise, it was this one tiny mortal that caught people’s attention in the recent years. Her French bulldog, Gary. Starting from White House dinner to book signing events, Gary was seen accompanying Carrie in most of the events that she attended. Gary followed her not only to formal events but also a number of interviews. Even though her last interview before she passed away was with Good Morning America, this particular interview with Stephen Colbert, on the Late Show stole our hearts. And yes, Gary accompanied her there too. Carrie Fisher who suffered a heart attack while on a plane was rushed to a hospital where she passed away last night.Gary’s Twitter account even posted a picture of Gary looking out of window with a caption saying that he will still wait for his “mommy”. Even though Carrie is widely acclaimed for her role in Star Wars, she is remembered for several other roles too. From 1975’s turn in ‘Shampoo’ to a 2014 cameo as herself in The Big Bang Theory, she played varitety of roles both on the big and the small screen.